This robot mower is technology in its rarest form. It is able to maintain your lawn with the greatest of efficiency. The good thing is that it is very easy to use. Because of its lightweight, the equipment is very manageable. It also runs quietly and operates efficiently with no emissions being one of its strongest factors. It’s cutting is accomplished with 3 pivoting razor blades with a variable height adjustment of .8 to 2.4 inches in height. As far as cutting on uneven ground, the mower can handle slopes with inclines of up to 45 degrees. 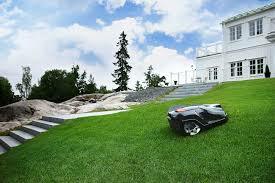 Its smart technology adapts the amount of mowing, with respect to the growth rate of the lawn. This enables spot mowing for areas of longer growth and also is responsible for guiding the mower through narrow passages. I give this mower a 9 out of 10 rating based on the running features that free up time from not having to mow your lawn and doing it well. Setting up the mower system may put the non-handy person in a bind but can easily be done as a DIY job with minimal effort. But if too challenging can be done by a local company as well. This mower does not come with a setup kit which can be purchased for about $99.00 but is worth the added expense of the results the mower will produce. Overall, this product is a very good & wise thing to have to maintain the regular cutting of your lawn which will improve the consistency of the thickness of your lawn in the long run. 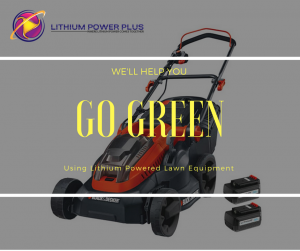 You can pick up this mower by going to the banner at the top of the home page going to Lithium Power Plus. It would be a great addition to your personal equipment and will perform an outstanding service to whoever owns one. If you prefer to have a Husqvarna robot mower that comes with an install kit look at this model the by clicking here. Thanks for visiting and leave any comments or questions in the comment section below. A few have started to appear and they are so quiet. I’m hoping that the craze will spread once they see how little effort is involved in keeping the lawn looking good. I’m looking forward to the days when the drone of a lawnmower is in the past. I know they are really nice. It won’t be long before the news will spread. It may not be good for the lawn service business but it is still a wonderful product. Thanks for visiting. WOW! 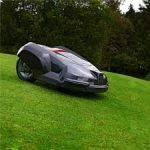 What an Amazing Lawnmower! I’ve never seen or heard about this product before! I don’t own a home now, but I’ll definitely be sharing this info with my Family Members who are Homeowners! It is a wonderful item. I think there are a lot of people who are not aware of it yet. I am trying to put the information out there so that people can see what technology has done as far as giving us yet more convenience. Thank you for visiting and I am sure your friends and family will love this product as well. Thanks for the review. Very helpful. I absolutely hate mowing my lawn. Was even thinking about just pouring concrete all over it. But might actually try the robot mower and keep the Mrs. happy. Yeah, we have to make sure they are happy. They really are the bosses. But this is probably a good item for you since you don’t really care for doing it yourself. Or you can pay a lawn service. Either way, at least it will be maintained. Thanks for visiting. This is the latest way to mow the lawn. Using this tool can mow the lawn more efficiently and save our time. Is this lithium power rechargeable? Can you operate the tool without using a remote? I think this article is useful and thanks for sharing. In fact, the robot mower detects when it needs to recharge and at that point, it returns to the base and recharges itself. You can use a smartphone or laptop to control it but you can also turn it on and it will perform without them.